My Sunday Photo today was taken while my husband and I were on a safari in South Africa in 2013. Though they weren’t captured in the shot itself, I remember the moment vividly. Our jeep had just stopped for our sundowner tipples before moving on back towards the safari lodges, when we rounded a corner and stumbled upon some young lion snoozing away on the grassy plain practically alongside us. We sat for a long while, just watching and observing them as they played gently together as they stirred and, as we did so, the sky turned into this amazing array or reds, so much so, that from a distance and above the tree line, it looked exactly like a forest fire. A truly mesmerising Safari Sunset! 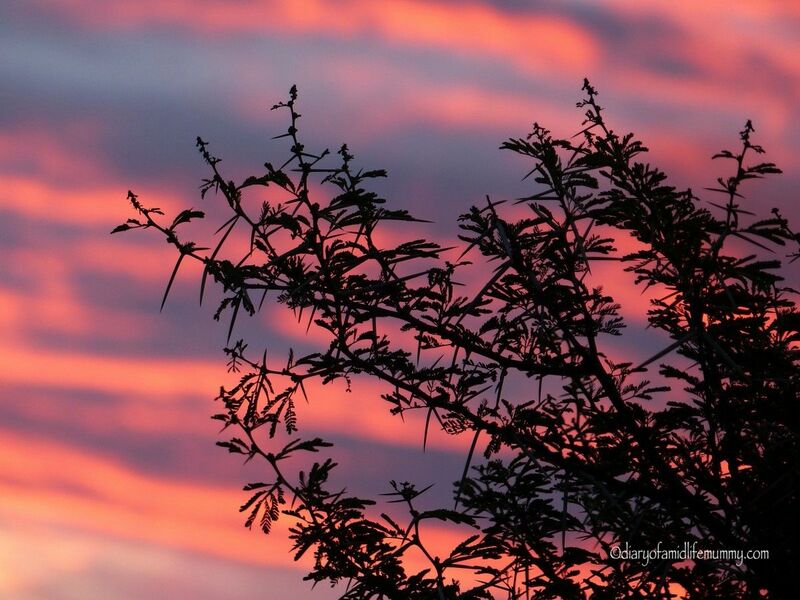 I love the colours in the sky and the silhouette of the branches is just beautiful. Great photo. What a great photo, love the colours, stunning! What a gorgeous photo – truly amazing colours! I’d love to see a sunset like that!